The Double-crested Cormorant is the most numerous and widespread cormorant in North America and the only one found in large numbers inland. It nests in scattered colonies with herons and egrets on the Atlantic and Pacific coasts and in the interior of the continent. The winter range includes the Pacific Coast from Alaska to Mexico, and the Atlantic and Gulf coasts from North Carolina to Belize. Smaller numbers winter inland along large rivers and lakes near the Mississippi. While never abundant, this bird disappeared as a nesting species in Tennessee between 1955 and 1992, most likely due to eggshell thinning caused by DDT. It currently breeds in colonies with other herons in scattered locations across the state. Rangewide Double-crested Cormorant numbers have recovered to such an extent that they are currently being blamed for declines in sport fisheries, devastating fish farms, and denuding nesting sites. Description: This large, dark waterbird has a long body, and a long neck. Adults have black plumage, an orange-yellow patch of skin at the base of their slender, hook-tipped bill, and eyes that are brilliant turquoise. In breeding plumage, adults have two tufts of feathers behind their eyes, hence the name 'double-crested.' First-year birds are pale on the upper breast and darker on the belly. Double-crested Cormorant characteristically rest in trees or on the shore with wings outstretched. In flight, they have a pronounced kink in their long necks. Anhingas, rare in West Tennessee, have a longer, thinner neck, a longer, thinner pointed bill, a longer tail, and males have a silver patch in the wing. Anhingas soar on long, broad wings, while cormorants do not soar. Neotropic Cormorants, very rare in West Tennessee, are smaller and thinner, the tail longer, and the bare skin around the face smaller. Habitat: Found on open water, reservoirs, larger lakes, and wide stretches of rivers across Tennessee. They nest on islands on some of the larger lakes in Tennessee. Diet: Primarily fish, but also crawfish and other aquatic vertebrates and invertebrates. Nesting and reproduction: Double-crested Cormorants first nest when they are 3 years old, and most birds nest in colonies with herons and egrets. Egg laying can begin as early as April and extends into May. Only one brood is raised per year. Clutch Size: Usually 4 eggs with a range of 2 to 7 eggs. Fledging: The young first fly at 5 to 6 weeks and are independent in about 10 weeks. Nest: The large bulky nest is made of sticks and often includes bits of junk like rope, fishnet, and plastic. It is lined with grass or similar material and placed in a tree or, less frequently, on the ground. Status in Tennessee: Double-crested Cormorants are an uncommon migrant and winter resident in East Tennessee, and a fairly common migrant and winter resident in Middle and West Tennessee. They are an uncommon breeding bird in the state, but numbers are increasing rapidly. Double-crested Cormorants were formerly listed as In-Need-of-Management in Tennessee when the breeding population disappeared and wintering populations were very low. 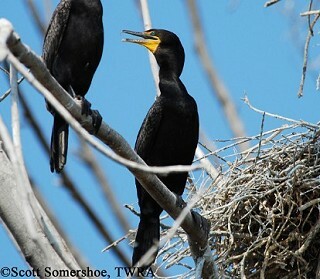 Double-crested Cormorant chicks are often exposed to direct sun. Adults will shade them with their bodies and will bring them water, pouring it from their mouths into those of the chicks. Captive birds will perch with wings open as if to dry them, even if they have not gotten wet. Hatch, J. J., and D. V. Weseloh. 1999. Double-crested Cormorant (Phalacrocorax auritus). In The Birds of North America, No. 441 (A. Poole and F. Gill, eds.). The Birds of North America, Inc., Philadelphia, PA.